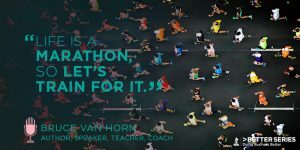 Bruce Van Horn, author, speaker, and coach tells us all how to prepare for life’s twist and turns. How we can choose every day to use our bumps as fuel that will position us for triumph and success. What are you training for?